When ever I make this dish Shyama just loves it. And what isn't there to love aobut it, they are deep fried and have a silky sauces and they are spicy and sweet. And I cannot find a reason why I didnt post it as it is such a delicious dish. 3 tbsp of cornstarch + Extra corn flour for rolling the balls before frying them. Salt and pepper to taste Take care of the amonut of salt as there is salt in the soy sauce and th oyster sauce..
1. Put all the above ingredients in a mixing bowl. Mix well and let it marinate for an hour. 2. Form it into little balls . Roll them lightly with the extra corn flour. Heat the oil and deep fry them till golden and keep aside. 1. Mix all the sauce ingredients together in a bowl and set it aside. 2. Heat some oil in a pan, stiry fry garlic, carrot and onions, ginger until fragrant. 3. Add in the sauce, bring it up to a boil, add in meatballs , pineapple and tomato. Stir well until sauce reduce and thicken. Finla, I always order this from my chinese but it's called Sweet and Sour chicken Hong Kong style. Your's looks amazing! This looks so appetizing and will be really wonderful to serve with some rice or pasta. This looks really yummy Finla! i make a similar sauce for batter dipped chicken pieces but have never tried chicken balls! Omg, seriously am drooling over that irresistible bowl...simply looks out of the world.. I love the vegetarian version of this...you've made it look tempting n perfect! 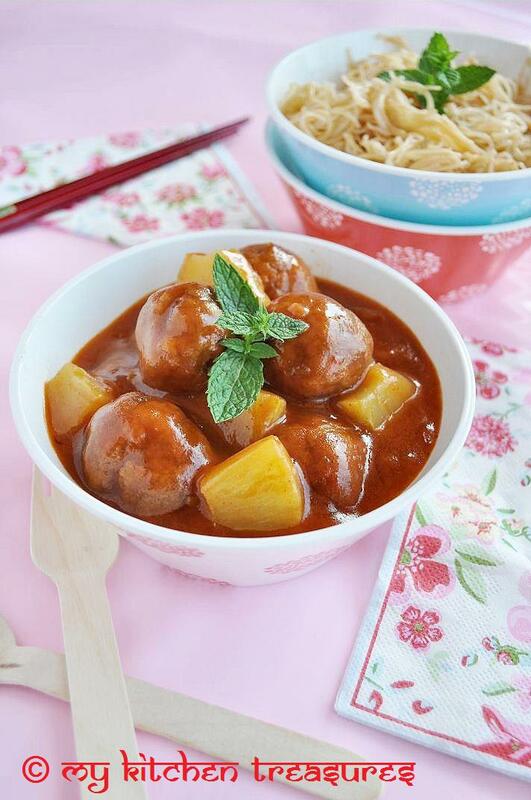 I ve made last week chicken meat balls but Indian version. I love this glazing sweet sour sauce! This dish looks fabulous Finla - I adore sweet and sour dishes. 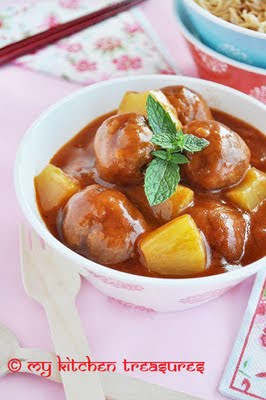 Simply delicious and lipsmacking sweet & sour chicken balls..very inviting! I have to tell you, I clicked on the picture and fell in love with your paper towels. Not to say the curry looks bad! Looks delicious! Deep fried are always tasty and the sauce compliments well. Nice clicks as well. Lovely! A marvelous dish. I love sweet and sour flavors.